Ok, Crysis scared the hell out of me yesterday, after a near miss , yet again! (4 now in one month) with a young and dumb deer at 80 mph in the morning commute (Crysis stopping power impressed me) coming out of a long corner over a small rise, I began my day with a massive injection of adrenaline . Heading home from work , stopped for gas, and Crysis was steaming, just for a few seconds. I tore her cloths off as it got dark, then got on youtube and here to learn about the cooling system. Steve has a few nice youtube examples. This morning , bright and early I tore into her: I have after market pipes, crues controll, bar weights, the flip down passenger back rest, cruiser pegs in front (removed them) and something else I can't remember, that is not stock. Turns out, the previous owner , who claimed he had just changed coolant and oil, and given it a valve adjustment six months ago , forgot to tighten the retaining screw on the pump out flow! . Just a quick tighten and I was working on my horn (it was a dirty switch/button) and trying to even out the carbs as previous owner said the center screw jut needs adjusting. Anyhow,, I need a Carburetor Synchronizer meter thingy, anyone have one they want to sell for less than 60 buck? (Ebay cost new) And , I have access to a duel carb meter,, was thinking I can do two at a time, then the center using 1 and 4, could that work? Would be free . Bottom line,, I can hear that the carbs are a bit off when run minimum throttle, one or two cylinders are weaker or nearly back firing (hollowly ), while two do the pulling. I tried using the "steady idle" method with the center screw only, ,and it made it worse, not better. For some reason, my Crysis idles like an alcohol burning funny car,, sounds awesome,, but some say its out of sync. I wonder if the after market slip on pipes make the idle so aggressive sounding, and if its been re-jetted too? Anyhow,, any suggestions until I get a carb meter would be great. I have not messed up anything yet,, but I have not made it better either. Get it here. works great. So the cheapy on Ebay for 64 bucks is not the right stuff? Hmm,, was hoping to put more money into the proper size front tire. 124 bucks , and my Crysis runs great really,, I'm just being picky. Well, if someone is near Grants Pass, or C resent City, I'd love an exuse to ride a much longer way to rent a carb sync, or pay someone to do it. Tell me please, how often do the carbs benefit from a sync with daily use, lots of riding? I'd recommend the Motion Pro carb sync. MOB uses one that syncs two at a time. Why not start with the free one and go from there? Maybe the owner of the sync tool can help you as well. All you need is the dual meter, two at a time. Awesome,, thought so,, 1and 2,, then 3and 4, then 1 and 4 for center sync if Im not mistaken, only thing I'm not sure about is the condom on carb 3 vacuum inlet. I'll have to look that up ,, again. Steve youtube to the rescue. The caps are there to prevent vacuum leaks when someone removes the air injection system. Yes 1to2, 3to4, then either 1to4 or 2to3.. If you talking about the cap on 3, that stays on when you are syncing other carbs. I bought the Emgo synch gauges, (dial type gauges) from Amazon. I think I paid $65. I synched my carbs after getting them back from SISF and they were dead on. But it seems most prefer the motion pro or carb tune. I was just trying to be frugal. if you do a good job sync'ing up your throttle plates before you install your rack of carbs, there is no need to worry about vacuum sync'ing so try not to lose sleep over what's the best 100 dollar tool to buy. if your bike starts instantly,gets great fuel milage,purrs like a kitten what more can you ask for ?? and before you comment that the previous owner just adjusted the valves... consider this... people sometimes make mistakes.... and you have see this already, by the facts noted about your coolant leak issue... so how much trust do you place in the adjustments and locking of the adjuster screws/nuts...? as someone mentioned, I use an electronic synch tool, I find it to be the most accurate, (the sensitivity can be adjusted on the reading) and easiest tool to adjust "pairs" of carbs, which is what this bike requires, 1 to 2... 3 to 4.... and 2 to 3.
during synching, plug all unused ports and disconnected hoses to prevent running issues during the synch. explanation about dial gages, and 4 tube synchronizers, vs comparative 2 circuit tool. 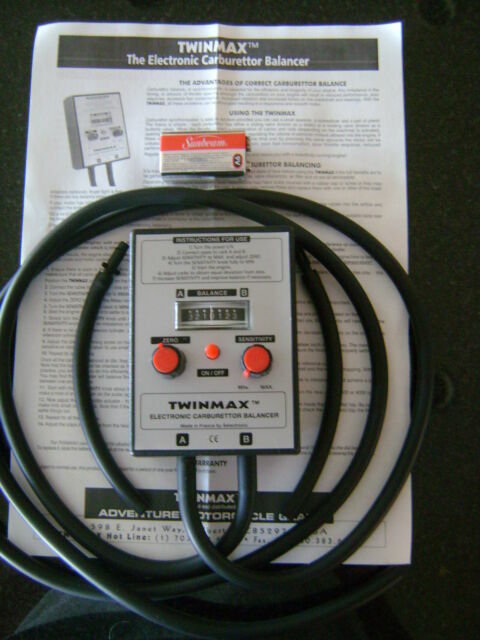 the Twinmax is a precise "comparing tool", it is adjustable for centering, and also sensitivity of needle bounce. Individual dial gages need to be calibrated, each one, and can go out of adjustment by poor handling very easily, now, consider a bank of 4 individual gages... are they all the same? are they all calibrated? How responsive are they all, or singly, to fluctuations in pulse? same goes for a 4 circuit "tube/slug" system, like the Motion Pro, but it is a good tool.. somewhat, but still there is the question if all 4 circuits are always identical.. as the tool ages, sits laying for long periods, after being exposed to contaminants in the vacume being sucked thru each circuit, or from atmosphere or is shaken vigorously during it's life. Having done comparisons of both 4 circuit tools, tied in to the twin max with "Tee" fittings, I have found neither of them as accurate, or as sensitive for the expense paid. Exactly what I meant,, thanx man,, it was mystifying me. And its only 20 dollars more than the Ebay cheapy . Bookmarked it. As per your question about the noise, I'm somewhat convinced that its the self adjusting cam chain getting ready to tighten. By the location on the left side, trailing down well below the valves, to where the cam chain tension-er is. and with the purring sound of the valves in the back ground, they sound really good. But I will get to it, when I am willing to have the bike non op for a day or two. Right now, I'm working on the things I can do on the fly with limited time. Crysis saves me a lot of gas money , I use her any chance I get. Lately I've been riding her in the rain. I'm amazed how dry I stay,, as long as I don't have to stop. Any how,, I can hear that at really low rpm one cylinder is a bit advanced over the others. I'ts only noticeable to me because I have owned so many inline 4 cylinder bikes. Crysis starts easily, runs perfectly, and performs well , or even better than some graphs posted here on the forums say she should, but she does not idol like a purring kitten, with carbon slip-ons, no baffle, she sounds like an angry grumbling predictor getting ready to eat someone. Like an alcohol burning funny car, sort of an off beat. Carb sync is the one thing the previous owner sais has NOT been done,, I have no reason to doubt that either. He's a really good guy, mechanic type, but he lets his "helpers" do the easy stuff, that is where the quality control might suffer. Besides, My friend , who I bought it from claims the previous owner (origional owner) did the valve adjustment for him when he bought it. Poor guy didn't get to ride it much, he's only 5'2",, and dropped it a couple times in his drive when he realized its too big for him and sold it to me.